Choose from a host of winter hikes on the SRK Greenway. All hikes are free and open to the public. Whether you are interested in exploring the greater Lake Sunapee Region, or you just want to get out on a trail with others – there is something for everyone! Be sure to contact the listed trip leader at least one day in advance to register your interest and get the details on meeting place and time. Always carry a substantial supply of water, a snack, and layers of clothing to prepare for possible weather conditions. Winter hikes can mean anything from snowshoes to microspikes or skis — make sure that you are prepared with the appropriate gear and clothing. Winter Hikes on the SRK Greenway! January is the time to look for moose antlers in the woods. Join Nick Baer on a bushwack snowshoe/ski looking for antlers, animal tracks, and other winter field biology signs. Expect a 4-5 mile snowshoe hike. For more information contact Nick Baer at (603) 526-8233. Explore the Springfield section of the Greenway. Join Nathan Richer on a XC ski on the Protectworth trail near Star Lake. This will be a 4-mile trip with some moderate elevation gain and loss. To find out more contact Nathan Richer at (603) 344-0287. Learn about winter tracking, trees and animal biology from Proctor Academy teacher, Dave Pilla. Leaving from the Proctor Woodlands Office Dave and Sooze Hodgson will lead a 4-mile snowshoe hike on the Proctor trails. For more information email Sooze Hodgson at doctorsooze@gmail.com. 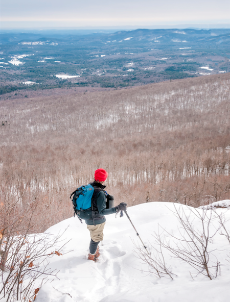 Join Charlie Baughman on a backcountry ski up and down Cardigan Mountain. A 4.4 mile ski on the Alexandria trail system starting at AMC Cardigan Lodge. This iconic backcountry ski trail will challenge and delight any skier. Appropriate gear necessary. Please contact Charlie Baughman for more info: (603) 667-3551. This entry was posted in Uncategorized by dgardner admin. Bookmark the permalink.